Over its ten year mission, Spitzer expanded its scientific study to include planets in orbit around other stars, offering insights that optical telescopes can't provide. This artist's concept shows Spitzer surrounded by examples of some of the exoplanets Spitzer has studied. Designed when the number of confirmed exoplanets could be counted on two hands, NASA's Spitzer Space Telescope has become a strong observer of these distant bodies, thanks to engineering forethought and ingenuity. Originally launched to study celestial objects in the infrared, Spitzer spent the first part of its life peering into stellar nurseries and galactic centers hidden by dust from optical telescopes. But over the last decade, it has been looking more and more at alien planets. Spitzer studies the universe in infrared light, which has a longer wavelength than the visible light captured by human eyes. The less energetic light is capable of passing through clouds of dust and gas that shield targets from optical telescopes. As a distant planet crosses, or transits, its host star's face from Spitzer's perspective, the telescope captures the dip in stellar brightness caused by the eclipse, revealing the planet's size. Spitzer also measures the infrared light emitted by the planet, allowing scientists to learn about its atmosphere. Changes in the planet's brightness in the infrared also provide insight into the planet's climate, while drops in that brightness as an alien planet passes behind its star can allow scientists to measure its temperature. The innovative use of Spitzer has led to a greater understanding of extrasolar planets, including the first cloud map of a planet outside of the solar system. When scientists and engineers originally designed Spitzer for its two-and-a-half year mission, exoplanets were just bursting onto the scene. Astronomers didn't discover the first alien world around a sun-like star until 1995; the current tally stands at almost 1,000 confirmed planets. But scientists didn't let intentions stop them from turning the infrared telescope toward these new finds. All that was needed was a little ingenuity. The fact that Spitzer still functions today, able to observe many of the recently found planets, is due to the forethought of its design engineers. The sensitive instruments on board the spacecraft can function only at ideal temperatures. The 33-inch (85 centimeters) telescope and three scientific instruments require temperatures just a few degrees above absolute zero, and are kept cool by an onboard tank of liquid helium. The coolant around Spitzer's science instruments lasted for five and a half years. 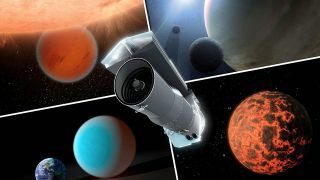 But the passive cooling system constructed by the engineers as a backup plan has kept one set of infrared cameras functioning at full sensitivity nearly a decade later, enabling it to study the wide variety of recently discovered planets. The wobble, which followed an hourly cycle, was caused by a heater that turned on and off periodically to keep a battery at its functioning temperature, researchers said. The heater caused a strut between the telescope and the star tracker to flex slightly, causing the telescope to wobble in comparison to the stars. Engineers quickly figured out that the heater didn't need to pass through its full cycle or temperature range. By halving the time and the heat produced, the wobble of the telescope was cut in half. But half was still not enough. Engineers sought to further reduce the wobble by utilizing the Pointing Control Reference Sensor "Peak-Up" Camera. During the original mission, the camera was used to calibrate the telescope's star trackers and to compensate for the natural wobble that occurs with the telescope. Engineers repurposed the Peak-Up Camera to the infrared camera observations, allowing astronomers to place stars precisely on the center of a camera pixel. Scientists took the process even farther, mapping the quirks of a single pixel to find the "sweet spot" that returns the most stable set of observations. About 90 percent of Spitzer's exoplanet observations are targeted to a particular quarter of a pixel. "We can use the Peak-Up camera to position ourselves very precisely on the camera and put light right on the best part of a pixel," Carey said. "So you put the light on the sweet spot and just let Spitzer stare." The ingenuity of astronomers and engineers has more than doubled Spitzer's stability and targeting, allowing for the extreme sensitivity needed to study planets in orbit around other stars. "Because of these engineering modifications, Spitzer has been transformed into an exoplanet-studying telescope," said Carey. "We expect plenty of great exoplanetary science from Spitzer in the future."